With a commitment to 100% pure essential oils and all natural ingredients, AromaWorks is built on this conviction and enriched by the passion of founder Jane Hibbert, who’s love for essential oils and purity stems back to her teenage years, when her pocket money was saved to buy and experiment with the best essential oils. Upon discovering that many skincare and home fragrance products were routinely made from less than pure and natural elements, Jane was inspired to create AromaWorks, driven by her vision for uncompromising purity. 5 years on, we have stayed loyal to our convictions, and are proud to guarantee that all skincare and home fragrance products are free from synthetic chemicals, pesticides, are not tested on animals and are safe for the environment. Throughout the years we have helped conscientious customers and spas worldwide experience the therapeutic (and guilt free) benefits of natural essential oils, whilst expanding our product range. With the exception of our exotic 100% natural essential oils, which are sourced ethically from their native lands, all our products are produced by us in our own factory close to our home in the UK, enabling us to keep a close eye on production, and ensure that throughout the supply chain our products live up to our high ethical standards. Most recently, we have brought our vision for ethical therapeutic products to the world of beauty. November 2014 saw the official launch of our highly anticipated skincare line for men and women. Revolutionary in its very concept, the line sought to combine clinical effectiveness, with environmental responsibility. After years of scientific and clinical research we succeeded in creating 25 products which on a molecular level improves the appearance of skin, reduces the signs of ageing and tackles very real skin ailments such as eczema, psoriasis and rosacea whilst being paraben free, sulphate free, petrochemical free, mineral oil free, nut free, gluten free, animal cruelty free, vegan friendly and is even safe to use during pregnancy. When it comes to natural remedies, it makes sense to protect the source. 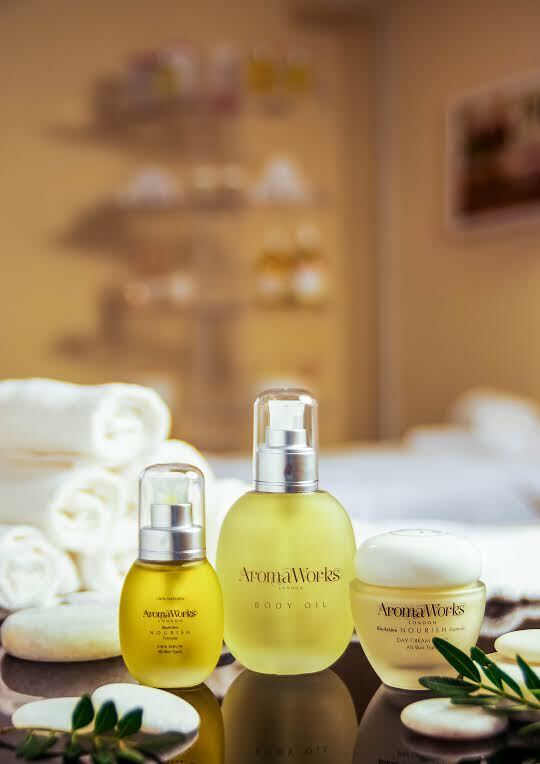 AromaWorks believes in maintaining the circle of wellbeing and so you can trust that all our products will always live up to our high standards of sustainability, whilst being effective, safe to use and 100% natural.